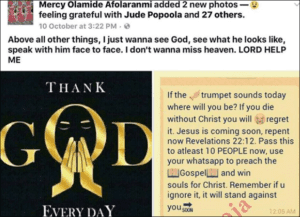 The eyes of the students and officials of OAU (Obafemi Awolowo University) were weary and teary as student of Microbiology at the Obafemi Awolowo University, Ile-Ife, Mercy Olamide Afolaranmi, has committed suicide. According to the school’s Chief Security Officer, Babatunde Oyatokun, Miss Afolaranmi, poisoned herself. Students and a neighbor close to the deceased also said she killed herself due to poor grade. A neighbor, Bimpe Oni, said Miss Afolaranmi, who lived off-campus at Sabo area of Ile-Ife, died on Thursday, after she took “rat poison mixed with battery extract. 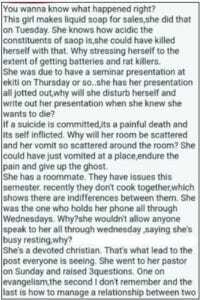 Mrs. Oni said the late student committed suicide because of “emotional pressure.” A student, Aisha, who was Miss Afolaranmi’s colleague in the Faculty of Science, said the deceased had ‘E’ in CHM101 (Chemistry for first year students), a reportedly dreaded course for year one students in the science and technology related faculties. .
Mercy often isolated herself in class and looked depressed,” said Aisha. 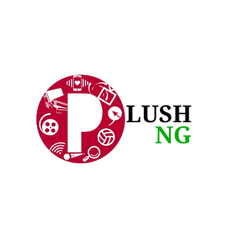 “She told me she had ‘E’ in CHM101 and has been going around unhappy before this incident.” Another student in the Faculty of Student, Opeyemi, said “she took poison because of result. Above all other things, I just wanna see God, see what He looks like, speak with Him face to face. I don’t wanna miss heaven. LORD HELP ME.